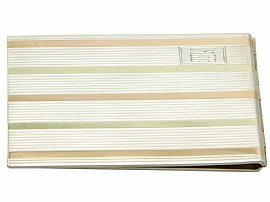 This fine antique American sterling silver and 14 carat gold Cartier notepad has a plain rectangular form. 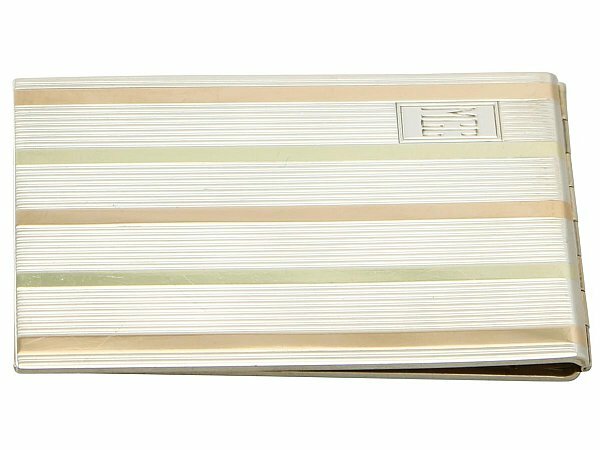 The surface of the notepad is embellished with engine turned decoration accented with inlaid alternating coloured stripes of 14 carat gold. The decoration to the anterior spring hinged cover of the notepad incorporates a rectangular cartouche to the upper left hand corner, displaying the contemporary engraved initials 'MCC'. This fine American, Cartier notepad has a gilded interior. This antique notepad retains the original Cartier writing pad with the printed boutique/retailer's mark 'Cartier, 653 Fifth Avenue, New York' on the front page. This antique notepad is a very good gauge of silver, fine quality and in excellent condition. This fine Cartier notepad is in presentation condition however, some pages of the original writing pad have been used. The sterling silver and 14 carat gold hallmarks struck to the interior surface of the notepad are very clear. Reflections in photographs may detract from the true representation of this antique item.